Nuance Salma Hayek is a premium beauty line exclusive to CVS/pharmacy® that combines exotic, natural ingredients, ancient beauty secrets and advanced science to create products that are designed to enhance the nuances that define every woman’s individual beauty. This great line as inspired by Salma’s grandmother, a cosmetologist who developed homemade beauty remedies, so the products feature Salma’s favorite ingredients from around the world. Dark Cacao & Coffee Firming Body Cream: Coffee Seed Extract with hydrating Cocoa Seed Butter and Rice Bran Oil helps stimulate and invigorate for smooth, toned and vibrant-looking skin, $14.99 for 8 fl. oz. Jojoba Dual Phase Body Oil: More enriched than a lotion, this innovative dual-phase spray with Jojoba Conditioning Oil leaves skin silky, soft and supple, $12.99 for 5 fl. oz. Prickly Pear Hydrating Body Cleansing Gel: Moisture-rich lather infused with Prickly Pear Extracts and Aloe conditions and nourishes for soft, radiant skin, $9.99 for 10 fl. oz. Five (5) lucky Lady and the Blog readers will receive all three of the great products listed above!! I would love to try Jojoba Dual Phase Body Oil. I love body oils. I feel they moisturize my skin better and they leave my skin glistening. I would love to try that cleansing gel!! Thanks for the giveaway! I love the body oil!! I would love to try the Dark Cacao & Coffee Firming Body Cream. Thanks for the chance to win! I’ve tried the blue agave curl cream and love it. I would love to win the Nuance prize pack. I really wanted to try Nuance, but unfortunately we do not have CVS locations in the state of washington! I would love to try the Dark Cacao & Coffee Firming Body Cream. It sounds great for my skin and i bet it smells so good. I would love to try Salma’s new line! The one that helps me look like Salma! The Prickly Pear cleansing gel sound wonderful! I’d love to try the Dark Cacao & Coffee Firming Body Cream. 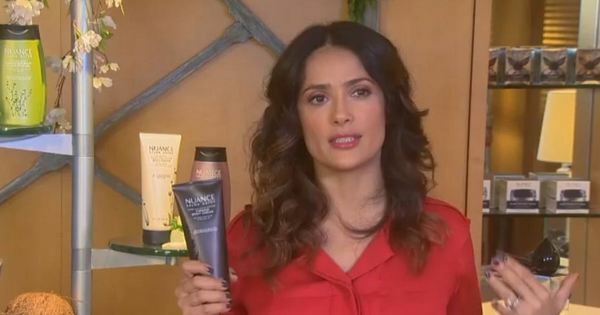 Nuance Salma Hayek Smooth & Shine Anti-Frizz Serum is a product I would love to try. I would like to try Prickly Pear Hydrating Body Cleansing Gel. I don’t have a favor product yet since I haven’t try them. But if I had to say which I would purchase first to try it would be: Jojoba Dual Phase Body Oil. I’d love to try the Correcting Spot remover. My favorite Nuance product is the Raw Honey Color Protect Conditioner. Would love to try the double phase body oil! I like Dark Cacao & Coffee Body Cream. It smells good and really works. I am interested in the dual phase body oil. Thanks! One Nuance product I would like to try is Flawless Coverage Mineral Foundation. Thank you for hosting this giveaway. I want to try her shampoo and conditioner. I think my favorite would have to be the Firming Body Cream! I’ve never tried any of her producuts but I’d like to try the Prickly Pear Hydrating Body Cleansing Gel. I would love to try the jojoba body oil, it sounds soothing for the skin. I would like to try the Prickly Pear Hydrating Body Cleansing Gel. i’d probably want to try the Prickly Pear Hydrating Body Cleansing Gel the most. I want to try the Nuance body gel! I would love to win this prize pack. Thank you CVS for another giveaway..
Eucerin is a great product Give it a try! I was watching Salma on TV were she was asked for her age, she announced her 45 years of beauty, she looked not only stunning but fresh and radiant, that was good enough to convinced me to not only buy her product but to sell it. Please let me know if this is possible.